URBANA, Ill. - Many people choose to move their houseplants outdoors in the summer. However, Rhonda Ferree, a University of Illinois horticulture educator suggests taking that a step further. A better option is to place low-light loving houseplants in partial shade outdoors. Examples include ferns, philodendrons, pothos (Epipremnum sp. 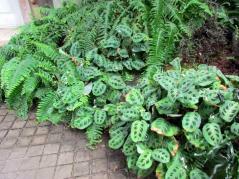 ), dieffenbachia, rubber and fig plants (Ficus sp. ), arrowhead vine (Syngonium sp. ), peperomia, cast-iron plant (Aspidistra elatior), holiday cactus, hoya, and bromeliads. Houseplants grown in higher light levels indoors should do fine in a sunnier outdoor location, Ferree said. These include geraniums, coleus, shrimp plant, cacti and succulents, poinsettia, and Easter lily. “These plants might need protection for a few days as they acclimate to brighter conditions. Cheesecloth draped over them for a few days will accomplish the purpose,” she said. Some houseplants that work well in hanging basket combinations include wandering Jew (Zebrina pendula), Swedish ivy (Plectranthus), spider plant (Chlorophytum comosum), prayer plant (Maranta sp. ), purple heart (Setcreasea purpurea), and string-of-beads (Senecio rowleyanus). Other houseplants to try planting in the ground include snake plant and African violet. “These are both easy to propagate from leaf cuttings so produce several in the winter for use outdoors in the summer,” she suggested. University of Illinois Extension provides more information on houseplants at http://urbanext.illinois.edu/houseplants/. “Tropical Punch” at http://urbanext.illinois.edu/tropicalpunch/ covers using tropical plants outdoors as focal points and accents and includes overwintering instructions.